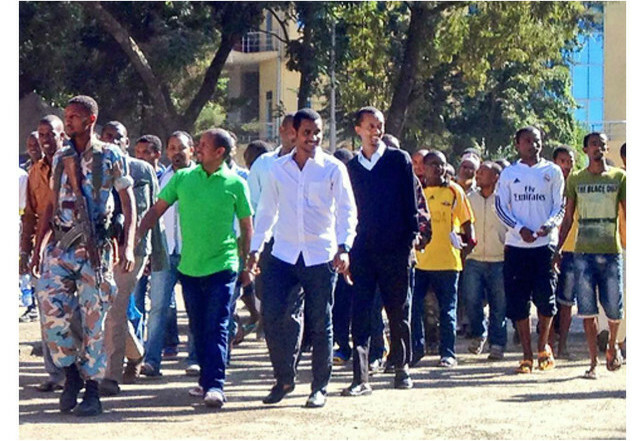 Since they were first arrested and jailed on April 25, 2014, Ethiopia's Zone9 bloggers have seen many twists and turns in their case. All told, they have appeared before the court over 30 times in 16 months, and been adjourned each time. But with the release of five of the detainees in July, the case has reached a critical juncture. Five Ethiopian writers (four in prison and one in absentia) remained on trial for terror-related crimes that the Ethiopian government claims were committed beginning in May 2012. Endalk Chala, a founding member of the Zone9 blogging collective and Global Voices contributor, walks us through the latest developments in the Zone9 bloggers’ trial before the next court session on Monday, September 7. When the bloggers were first arrested on April 25, 2014, they were not allowed to be visited by family members or to have a legal counsel for about three weeks. The never-ending trial of the bloggers started to unfold only four weeks after their arrest. However, during those four weeks friends and families of the bloggers reported seeing the bloggers’ Gmail accounts as logged in. The active green dots of their Gmail accounts alarmed the loved ones of the bloggers, and many suspected that the bloggers had been tortured to disclose the passwords of their Gmail accounts during the prolonged pre-trial investigation phase that took a little over three months overall. The arrest and the conditions in which the bloggers were held in prison made the May 17th trial important because it presented an opportunity to check if the bloggers were unharmed. Before May 17, it was reported that the bloggers were brought to the court covertly, but no one was able to attend that trial to confirm. No one was able to see them until their May 17th trial appearance. Friends and families had to wait anxiously for hours in the compound of the dilapidated Arada court where the trial started, before the government decided to move it to its current venue, Lideta High Court. When the bloggers were brought to the court people had to squeeze past each other to take a picture of them while they were escorted to the court room. There were a lot of security guards surrounding the bloggers and the environment was quite tense. Despite journalists and friends of the bloggers facing immense pressure from the security personnel, they live-tweeted and posted pictures of the bloggers’ trial. Concealing his phone, one of the people in attendance tweeted what the police officer said to him when he tried to take a picture of the bloggers on their way to the court: “Pointing his index finger towards the ground the police officer yelled at me; you cannot take a picture of even this ground let alone the bloggers.” Ever since, this kind of police behavior has become a trend; in most of the trials police offers would ask those in attendance to switch off their mobile phones whenever they were in the court compound. This now looks to be the standard procedure in the Ethiopian court environment. Cameras or any recording devices are not permitted in the court rooms, even though Ethiopian law affirms all trials to be public. Throughout the 16-month-long trial, it was not uncommon to see long lines of people waiting outside the doors of Lideta High Court to attend the trial of the bloggers, but entering the court room has always been a challenge. From security people to court ushers, most of the court employees have been deterrent and hostile, while the manners of the police officers towards people who wanted to attend the trial of the bloggers have always been rough. Over the 16 months of the trial, a minimum of three individuals who attempted to take a picture of the scene of the trial using their mobile phones were reportedly briefly arrested and asked to delete the pictures they captured. In light of this, it is not surprising that the bloggers themselves were put through so much during the entire process. The 23rd Criminal Bench is a typical shabby court room located in the upper end of the larger Lideta High Court compound. Even though the trial has been adjourned 36 times over the last 16 months, the total amount of hours the bloggers and their legal counsel spent in this court room attending the proceedings is less than 10 hours. In a typical trial day, the bloggers spent less than 8 minutes in the court room without any substantial legal or procedural arguments. Half of the time either the judges or the prosecutors would walk into the courtroom late to take their seats on the highest tier of the raised platform in the room and then the prosecutor would ask for an adjournment. Sometimes they kept the proceedings to the very last moment, working on other criminal cases before they turned their attention to the bloggers, making them sit on long wooden benches in front of the room just to adjourn the trial. The bloggers are expected to be back in court this coming Monday, September 7. Will the court adjourn the trial again? For more context on the trial, read this July dispatch and this August report.